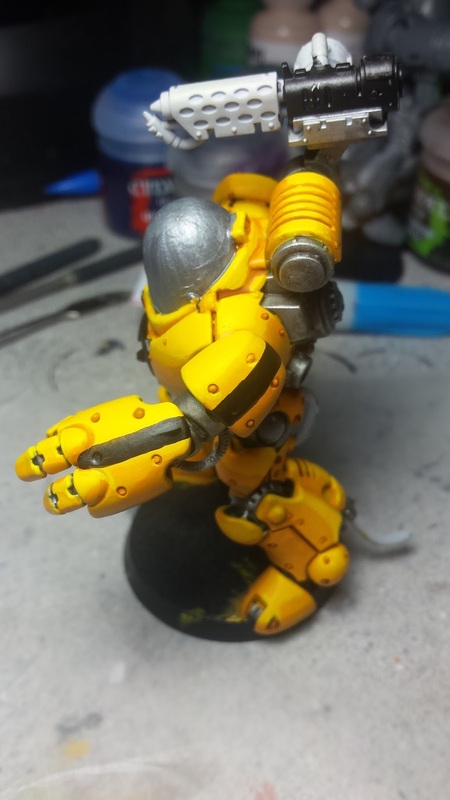 According to the fluff, a lot of Kastelan Robots have been lost over the years and the Mechanicum have been searching the galaxies for them. Also, the Cult Mechanicus codex has a section in there showing off a bunch of different paint patterns for individual robots. That got me thinking, what if each robot was unique? Kinda like how R2-D2 is different from all the other R2, R3, R4, etc robots. What if the fisty robot was completely different than the shooty robot? And not just color scheme, but overall look too? With that I started playing with green stuff and began filling the "eyes" in. I kind of wish I had this idea before the head was glued into place, but that's not how my idea factory works. So I ended up doing it all on the mini. I had other ideas too. But those will have to wait for other robots than these two. I'm really liking the Cohort Cybernetica formation in the codex, and if I build it, I'll need many more of these guys. painted all the silver metallic bits, such as arms, legs and his engine. 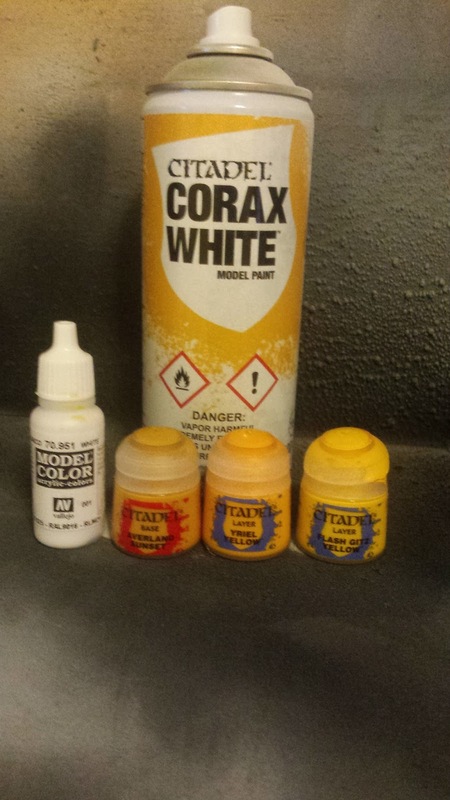 With the silver all ready, I repainted the armor plating with Vallejo White, which is a lot brighter white than the Corax spray (which is kind of on the grey side). I started the yellow with the mid-tone and painted all of the armor Yriel Yellow. In order to get even coverage it ended up taking 3 coats of paint to get it looking nice. With that done, I started painting all the recesses and shadowed areas with Averland Sunset. But I wasn't fully happy with the shade difference and decided to mix in a bit of brown and began painting the deep shadows. 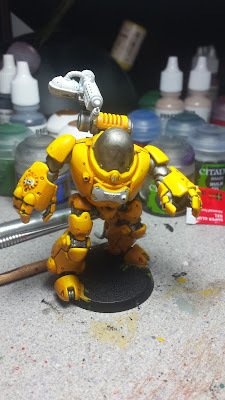 From there it was time to highlight the armor and I used Flash Gitz Yellow. All of the areas where light would be hitting got coats. This also took about three coats. muted yellow was the better route. With the yellow all finished I decided that it was time to get going on the black sections. Looking at examples in the Cult Mechanicus book, I liked the idea of striping and decided that one arm and one leg would get stripes. 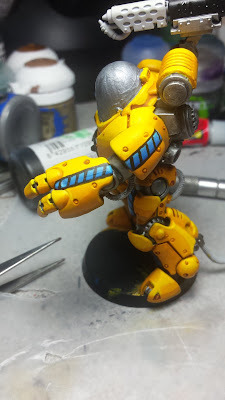 I painted the left arm first and when I got to the leg, I couldn't decide it I wanted the stripe on the front or side of the leg. Finally after picturing it in my head, I went with the front stripe... mostly because if it was on the side, it'd look like he was wearing a tracksuit. But, the black stripe looked really plain, and I wasn't sure what to do about it. After letting is sit for a little bit, I finally decided to add some blue to the middle of it for a complimentary color. But that's not all, after the blue was added, it still seemed like it needed something more. The hazard stripes definitely work much better as an additional detail than the plain ol' black stripe did. Plus it let me work on my straight line painting. In the end, I decided to thicken the edge lining and realized that the hazard lines weren't connecting to the edge lines properly. That's all been fixed now. Now that the striping was done, I moved on to the copper sections. To give the mechanical sections a bit more character, I made the pivot points on the legs and arms copper color. 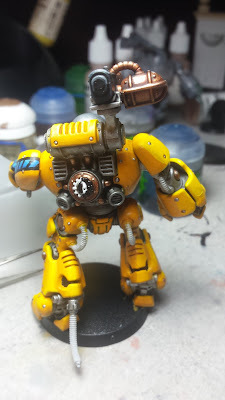 The center plate of the engine, with the Crux Mechanicus on it and the shroud for the flamer were also going to be copper. 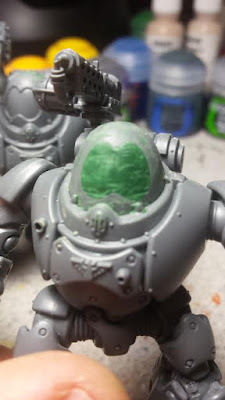 To paint the copper, I followed the same steps as I did for painting the Skitarii body armor. corroded, worn and rusted too. So I need to up my game on that front. Luckily I have some twitter friends I can fall on for information. It also helps that I see rusty metal and worn paint at work all the time. Which means I have plenty of things I can take pics of for references. That's all for now though. 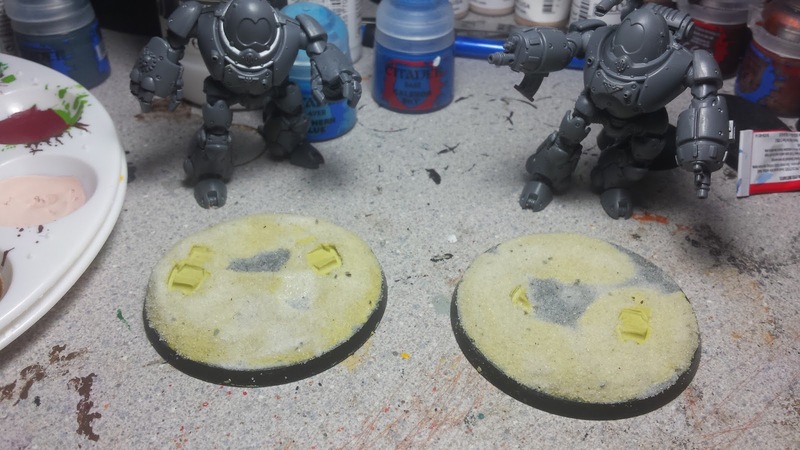 I've begun working on the weathering and I also have the base done, for the most part. But those will have to wait for another time.